So far, 1942 had gone badly for the British, the most notable disaster being the fall of Singapore. But Churchill had resupplied the Eighth Army in North Africa and was hoping that Ritchie would achieve the kind of victory against Rommel that O’Connor had achieved against the Italians in 1940/1. Ritchie’s forces were well dug in along the front line south of Gazala and, further back to the east, South African major-general, Bernard Klopper, had fortified the coastal town of Tobruk. But instead of the British launching an offensive, the initiative passed to Rommel. By the second week of June, Rommel’s Afrika Korps was advancing and had penetrated the British front line at Bir Hacheim, despite the spirited defense mounted by de Gaulle’s Free French. By 14 June, Churchill was told that the Eighth Army might have to withdraw to Egypt but that Tobruk could be safely held and supplied by sea. This week in the war, on 15 June 1942, Rommel informed his superiors that he had won the battle against the Eighth Army and that he would soon capture Tobruk. After a series of massive air bombardments, German tanks entered the town on 20 June. This week in the war, 0n 21 June 1942, Tobruk surrendered. Rommel captured not only Major-General Klopper, but also five other generals and over 30,000 troops: South African, Indian, and British. Churchill was in Washington at the time of the surrender and records his shock in his memoirs: “This is one of the heaviest blows I can recall during the war.” [Winston S. Churchill: The Second World War (Cassell, London, 1959).] 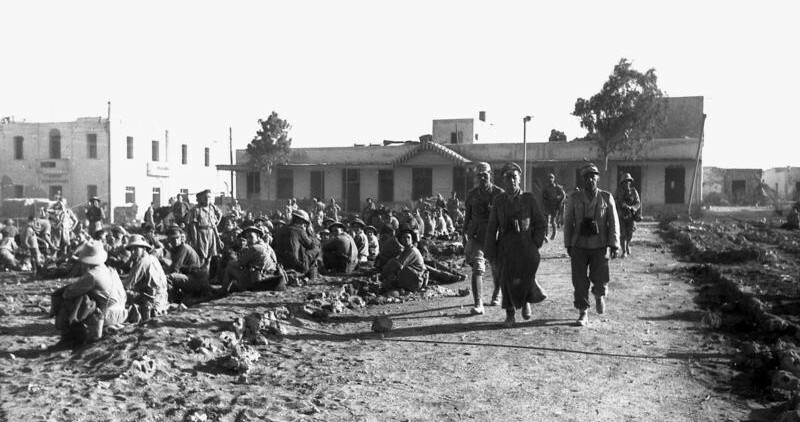 Tobruk’s garrison of 30,000 experienced troops had surrendered to a force of half their size. This entry was posted in World War II and tagged Klopper, Ritchie, Rommel, Tobruk. Bookmark the permalink.